New Haven County is a county in the US state of Connecticut. It is in the south central part of the state. The population was 862,477 in 2010. This made New Haven County the third most populated county in Connecticut. There are 1,340 people per square mile. 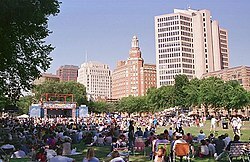 Two of the state's largest cities, New Haven and Waterbury, are part of New Haven County. Starting in 1960, county governments were no longer active. Until 1960, the city of New Haven was the county seat. In Connecticut, towns are responsible for all local government activities. This includes, fire and rescue, snow removal and schools. The county Sheriff plan was removed by voters. This was replaced by State Judicial Marshals in 2000. Because of this, the state judicial plan in New Haven County is divided into three districts: New Haven, Ansonia-Milford and Waterbury. This page was last changed on 11 February 2019, at 07:17.